Members of the Class of 2018 at Vance County Early College High School were honored during the evening of May 15 at their Class Night. A total of 38 seniors are in the graduating class. During the Class Night celebration, they received accolades for their accomplishments in high school and many of them were presented with thousands of dollars in scholarship funds to further their education at four-year colleges and universities in the fall. An audience of over 400 parents, other family members and friends attended the event in the Civic Center at Vance-Granville Community College. Members of the Class of 2018 include: Hunter Antel, Danielle Ayscue, Nancy Bonilla, Andrew Brame, Anaya Brown, Mercedes Brust, Cameron Bullock, Brittany Burroughs, Ke’Moni Champion, Brooklyn Davis, Zairea Davis, Zenee Davis, Hong Dong, Malcolm Elam, Jr., Nealee Fisher, Lehman Ford, Alayna Gallagher, Elizabeth Gonzalez, Courtney Herndon, Brandon Hughes, Victoria Inscoe, Lillian Kanouff, Jade Lewis, Seth Moody, Brandy Patterson, Britney Patterson, Jimmy Ponce, Hannah Roberson, Jordan Rooker, Alexis San Juan, Ty’Ayala Shearin, Evan Stinson, McKenzie Taylor, Latia Thomas, Rosalinda Vazquez, Matthew White, Kaela Williams and Suzanne Williams. 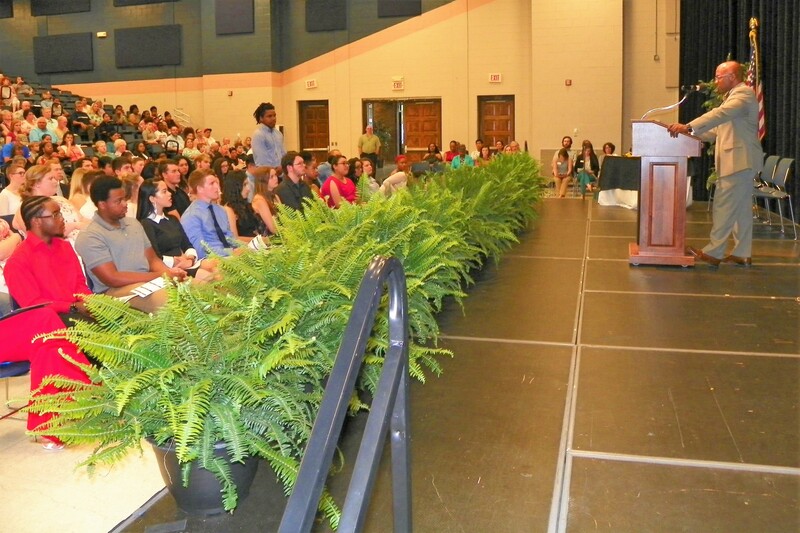 Image Information: Travis Taylor stands at the podium as he announces the recipient of a college scholarship from among the Early College Class of 2018 during Class Night.